← Earth Spared Apocalypse!…Now Can We Get Back to Saving the Planet Please? 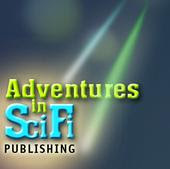 Hot on the heels of the profile on SCI FI Wire, the Adventures in Scifi Publishing podcast has posted (here) the second of two podcasts recorded at this year’s Writers of the Future week. This one features interviews with some of the writer and illustrator winners, as well as writer judge KD Wentworth and illustrator judge Laura Brodian Freas. If you’re a writer you should also check out the first podcast, which is the fantastic presentation we received on Thursday afternoon from Kevin J. Anderson and Rebecca Moesta on how to succeed as a professional author. Find that one here. Thanks to Shaun Farrell of ASFP for the great interview.